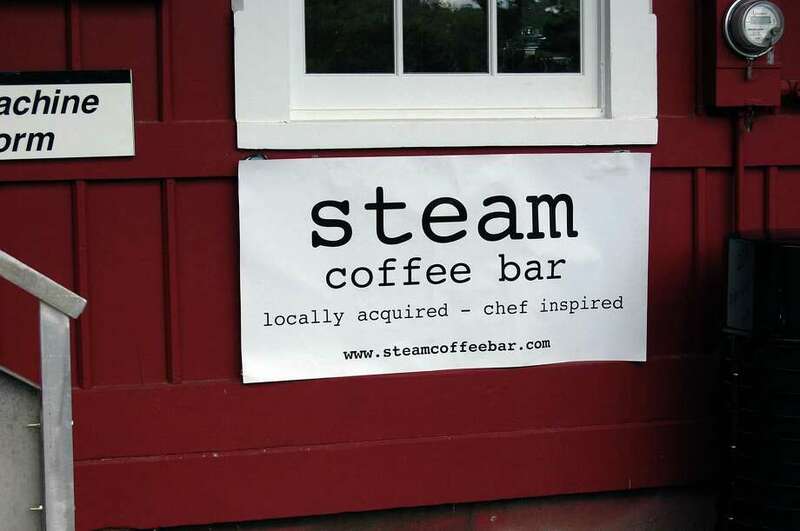 Steam, the new coffee shop at Greens Farm train station, opened Monday. Phil Brown has been commuting into New York City from the Greens Farms train station for 16 years, and until a few months ago he and his wife, Lynn, had a morning routine. Lynn would pull the car up in front of the stationhouse, and Phil would go inside and buy them both coffee from George Russo, former proprietor of the Greens Farms C&P coffee shop. But Russo closed earlier this year, and in the interim the Browns have had to stop at a variety of alternatives -- Dunkin' Donuts, Starbucks, the Mobil gas station -- to get their morning java. With Monday's grand opening of Steam coffee shop at the Greens Farm station, the Browns can return to their old routine. "It's nice to have a local place back again," said Phil Brown, who lives in Westport and works in media sales. "It looks really nice, they did a great job in here." Steam is co-owned by Briana Pennell, a trained pastry chef who attended the Culinary Institute of America, and her step brother Chris Barrett, who studied business at UConn and has worked in restaurants in New Orleans and elsewhere. Barrett said some visitors Monday arrived at the shop with coffee in hand, unaware the new shop was opening. "A lot of people poked their head in (Monday) and said they'll be in tomorrow or later in the week," Barrett, a Stamford resident, said. Earlier this year he and Pennell, who lives in Norwalk, won the town contract to lease space for coffee shops at the two train stations in town. The Saugatuck shop will open sometime this fall. Steam replaces the Greens Farm C&P that Russo had run since 2003. The town in December issued "request for proposals" for a new coffee concession at each of the two rail depots. The RFP was part of ongoing revitalization of the stations. During the last year, the eastbound terminal at the Saugatuck station underwent a major renovation. The improvements included refurbishment of the building's interior and exterior, as well as installation of solar panels on the station's roof. That solar array powers a new electric-vehicle charging facility at the station. A similar array might be installed at the Greens Farms station, according to town officials. The Greens Farms shop will be open weekdays from 5 a.m. to noon. In addition to locally brewed Raus Coffee, the shop will offer espresso, cappuccino, fresh juices, pastries and newspapers. The town will also be installing free wifi at the station, Barrett said. "We're trying to accommodate people as much as possible. We want to make the commuters as happy as possible because it generally is a waiting area for the train. Most people are happy to see us here, something new," he said.